The AWC: Free Help with Essay Writing. Last Week. Phone Appointments. The Academic Writing Centre will close on Friday 13 December and re-open in late January. This week, we are open everyday 11-1 and 6-8. You do not need to book an appointment, just call in to us on floor 2 in the James Hardiman Library, Make sure to bring some recent work (notes, drafts, past assignments, or current assignments). This week we are also testing out our new service: Phone Consultations for Distance Learners. This is open to academic staff and class reps in the College of Arts, Social Sciences & Celtic Studies. Access to the library catalogue has now been restore. Thanks again for your patience. We're currently experiencing some glitches with our library catalogue system this evening. We're really sorry about this, and are working to get it resolved asap. The competition is now live. Every year, the Academic Writing Centre holds a writing competition. This year's prize is I-Pad 2. The winner's piece will be published in the Sin newspaper and on the AWC website. We would like to invite you to a 15-minute presentation to ask questions, get a re-cap of the rules, and pick up some tips. The presentation will be held today, on Wednesday, 27 November 2013 at 3.15, in the Training Room at the James Hardiman Library. 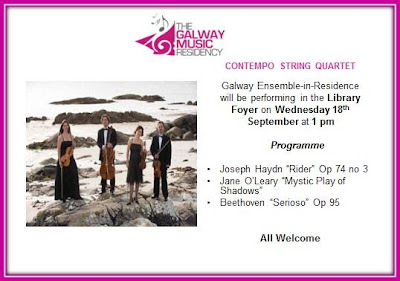 If you have a question about the presentation but cannot come to the presentation, email irina.ruppo@nuigalway.ie. If you have not yet visited the Academic Writing Centre this term, please drop in today (11-1 and 6-9). One of our tutors would be delighted to look over your work and help you improve your writing. The Medical Library & PC Suite has reopened following this morning's leak and power outage. We apologise again for any inconvenience caused. Due to a water leak and power outage in the basement of the CSI Building this morning, the Medical Libary and the PC Suite are closed. Work is ongoing to restore power and we will provide an update in due course. The Academic Writing Centre will hold two group workshops on 6 November 2013. At 2pm, we will hold the first writing group session for PhD students. These sessions have been designed to support PhD students throughout the writing process. Please note: You will need to be able to access your work from the computer suite PCs to fully benefit from the session. At 6pm, we will hold a workshop on 'How to Write Better Essays' for undergraduate students. 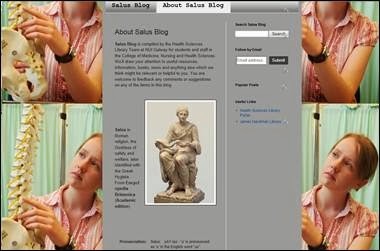 The Library launched its new Health Sciences Portal and Salus (Health Sciences) Blog today at a lunchtime event in the Medical Library, CSI. 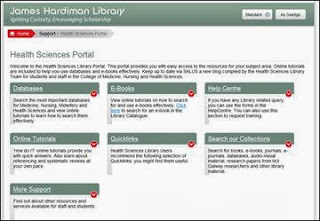 The portal and blog were warmly received by both the School of Medicine student body and academic staff present at the event. Dr. Rosemary Geoghegan speaking at the launch referred to the excellent collaboration between Library Staff and School of Medicine academic staff and students which had brought this valuable resource to fruition. The portal is the Library's response to feedback from our Health Sciences users requesting a one stop shop where all relevant resources could be easily accessed. 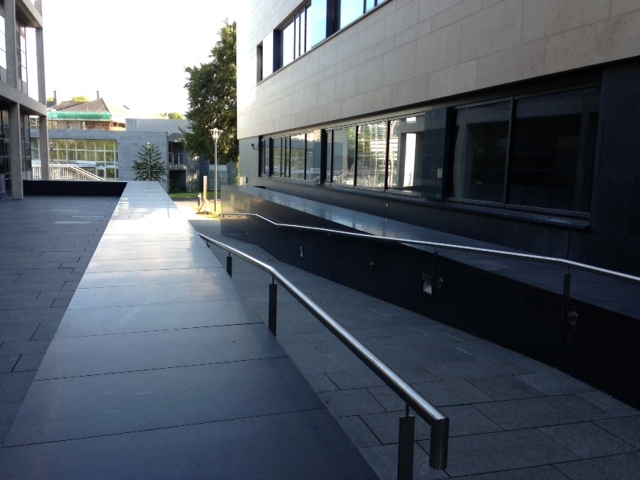 In order to facilitate the installation of a new Access Control System, of which more anon, temporary entrance/exit routes to and from the James Hardiman Library will operate from Monday 9th September to the end of the month. Please look out for the signs that will direct you to these temporary routes. Apologies for any inconvenience caused. Approach via the slipway between the James Hardiman Library and the new Hardiman Building adjacent to the Library, at the top of the slipway proceed straight ahead and enter the Hardiman Building via the emergency entrance doors and then walk through the foyer towards the sliding exit doors. Just before reaching these doors turn right and walk along the short corridor leading into the library. 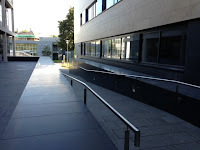 Approach via the slipway between the James Hardiman Library and the new Hardiman Building adjacent to the Library, at the top of the slipway turn right and enter via the emergency door on the western side of the James Hardiman Library. Throughout September the Library offers drop-in ‘Getting Started in the Library’ sessions to help you find your way around the Library’s 500,000 books and the many services available to help you in your studies. 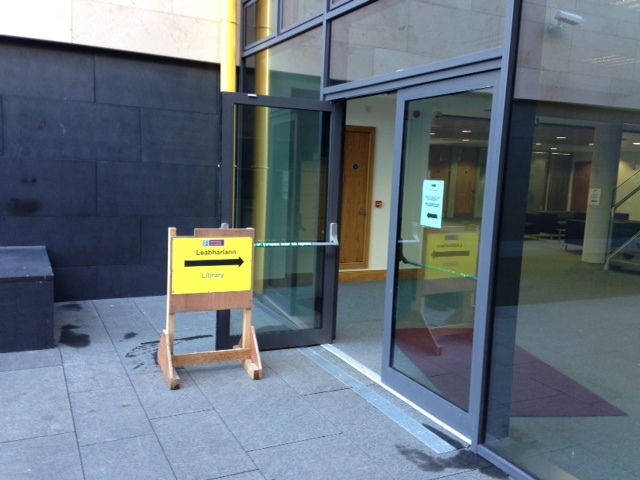 No need to book, just call in to the Training Room on the entrance level of the Library. Welcome back to all our returning students! You'll see that things are looking a little different around the Library and that change is afoot. We apologise that our summer building work is not quite finished yet. A new foyer area is under construction and while it is being finished the entrance to the Library is from the back of Library, up the ramp between the new building and the Library building. 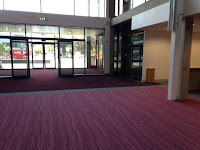 Please keep an eye on the Library website over the next week or so for news regarding temporary entrance/exits to the Library as the building work progresses. The other big change we've been working on over the summer is the introduction of a new Library and IT Service Desk. 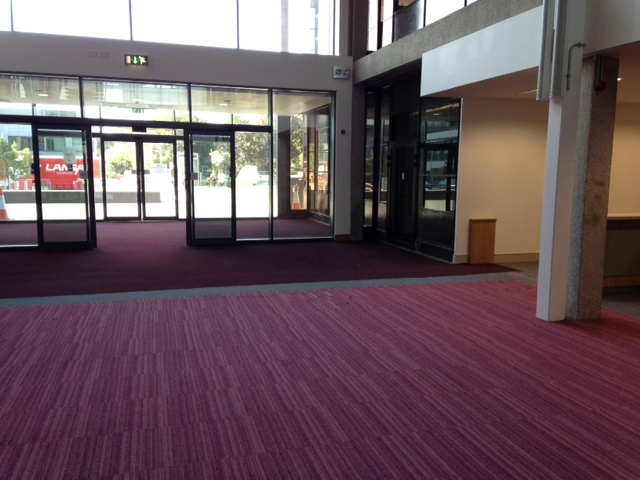 The service desk will be located in the new foyer of the James Hardiman Library and will offer first level support for all Library and IT queries. You can contact the Service Desk by email at servicedesk@nuigalway.ie, by phone at 091 493399 or visit our webpage for more information. We wish you all the best of luck with the new academic year. To make a good start to your academic year, drop in to one of our Getting Started in the Library sessions to find out all about how to make the most of library services. Where: Library Training Room, just to the right of our temporary entrance. When: Monday to Thursday 11.00; Monday to Friday 14.00 throughout September. Alexander Street Press has provided 12 months trial access to the online resource British and Irish Women's Letters and Diaries. British and Irish Women’s Letters and Diaries includes over 100,000 pages of material assembled from numerous bibliographies and from newly conducted research. Alongside the published material are 4,000 facsimile pages of previously unpublished manuscripts. Please complete the feedback form available from the link above if this resource is of interest to you. 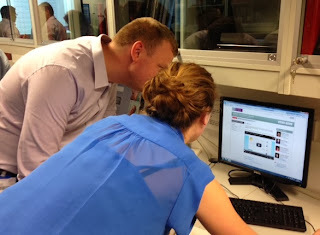 This is the first online collection of streaming video developed specifically for training and developing teachers. Upon completion, the collection will contain more than 3,000 video titles totalling 1,300 hours of teaching demonstrations, lectures, documentaries, and primary-source footage of students and teachers in actual classrooms. It will give education faculty, students, and in-service teachers a single source for the best research-based professional development video resources available. This release now provides 3,530 titles, equalling approximately 840 hours. Please note that access to your final year results will be blocked if you have overdue loans or fines on your library account. The same applies to any outstanding course fees. Following the return of any overdue books and the payment of fines, access to your results will be granted within 24 hours. Having looked at our loan usage patterns we are increasing the number of times you can renew a book loan from 3 to 5 times as long as no other user has requested the book. This change will take effect from 1st June , 2013. A trial of Drama Online (beta version) is available until Wednesday 29 May. For further information about Drama Online click here. Please complete the feedback form available from the trial link above if this resource is of interest to you. Peace Process: Layers of Meaning is a hybrid project involving collaboration between Queen Mary, University of London, Trinity College Dublin and Dundalk Institute of Technology. The project has three main elements: the collection and storage of one hundred heritage interviews of the recollections and views of key figures in the Peace Process; the imparting of interview skills to students, teachers and community members in the border area; and the development of an online directory of all extant interviews relating to the Peace Process (LOMOND). The LOMOND directory is intended as a select but authoritative archive, maintained regularly and available on-line, providing an essential research tool for students across the educational spectrum. In the manner of a decades-long time-lapse camera, it will permit users to access an instructive and suggestive record of changes in thinking, in public styles and statements, in sets of possibilities, in pressures experienced and insights gained or rejected. This adds a dynamic and human dimension (in the sense of fallibility) that would otherwise largely perish, to the impoverishment of understanding. In concept and design it is intended to draw attention to the many layers of peacemaking and conflict. A trial of University Press Scholarship Online (UPSO) is now available. UPSO offers 11,000+ titles available in 25 subject areas from Oxford and 10 other leading university presses. It brings together the best scholarly publishing from around the world. Aggregating monograph content from leading university presses, UPSO offers an unparalleled research tool, making disparately published scholarship easily accessible, highly discoverable, and fully cross-searchable via a single online platform. Research that previously would have required a user to jump between a variety of books and disconnected websites can now be concentrated through the UPSO search engine. There will be a training session on Introduction to EndNote X5 (for Windows) held on Thursday 23 May. This training session is open to teaching staff, taught postgraduates and undergraduates in the College of Arts, Social Sciences & Celtic Studies. The Reading Room will remain open from 07.00 to 01.30 every day over the weekend. Thursday May 02nd at 2pm in the James Hardiman Library (Basement PC Suite). The library provides full text access to International (ISO), European (EN) and Irish (IS) standards via a subscription to NSAI Standards Database. A trainer from i2i the database provider will be coming to Galway to deliver a workshop on getting the most from the standards database. FRANTEXT is a French-language database which consists of about 4,250 French texts spanning from the medieval period to the present day. Launched in the 1970s, it has been available online since 1998. It is developed and maintained by the ATILF-CNRS (Analyse et Traitement Informatique de la Langue Française-Centre National de la Recherche Scientifique). FRANTEXT provides access to a wide range of literary, philosophical. technical and scientific works. It has recently been enriched with a corpus of autobiographical texts which will interest historians and sociologists as well as literary researchers. Specific words, lists, regular expressions, etc. can be located in an individual work or corpus. The database is constantly updated. There will be a training session on Introduction to EndNote X5 (for Windows) held on Thursday 18 April. This training session is open to teaching staff, taught postgraduates and undergraduates in the College of Arts, Social Sciences and Celtic Studies. From the15th of April 2013 the Academic Writing Centre will be open every Monday, Wednesday, and Friday 11-1pm until May 24th. The AWC writing tutorials are free, and everyone is most welcome to attend. Land Law students studying at home or on campus should note that Wylie’s textbook Irish Land Law is available electronically (via Lexis Butterworths). To open up the Wylie book follow these simple instructions. 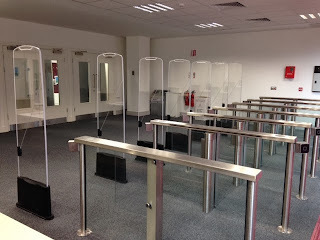 Commencing on Monday 25th March it will be compulsory to show your University ID Card on entering the Library. Please have your card ready for inspection as you approach the entrance door to avoid queues developing. This measure is being introduced to ensure that only registered users gain access to study places and facilities in the lead up to the Semester 2 exam period. I would also like to take this opportunity to encourage you to visit the AWC. The answers to the frequently asked questions (below) should be of interest to those of you who have not yet availed of this service. 1. Why should I visit the AWC? To improve your writing and, by extension, to start getting better grades. One of our tutors will go over your work with you, identify areas of improvement, and help you overcome any problems you might have. 2. Do the tutors proofread students’ work? No. The AWC is not a proofreading service. Its objective is to help students become better at writing in academia. 3. I want to visit the AWC. Do I have to make an appointment? You do not need to make an appointment, just drop in during our opening hours. 4. What if I want to make an appointment? 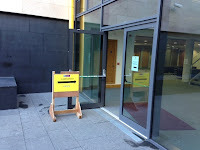 If you prefer to make an appointment, you can do so at http://awcnuig.eventbrite.com/. This option does not cover all our opening hours. 5. What do I need to bring to my session at the AWC? Please bring some recent written work; rough drafts, completed assignments, and notes are equally acceptable. 6. Can any student use the AWC? Yes. Students of any discipline, level, and year of study are equally welcome. 7. Does the AWC offer other services? Yes, there are group workshops and the AWC annual writing competition. EXPLORE projects include a visual exhibition, Words and their Meanings, and an on-line course on academic writing. 8. Where can I get more information? The Facebook page is used for announcements, tips, and links and is well worth checking out. The NSAI standards database has a new interface. You can search the database for standards from a range of global standards organisations. The library subscription provides full text access to Irish (IS), European (EN) and ISO standards. Download this guide to searching for standards on the NSAI database. We listened and redesigned the library’s website and catalogue. Now we need your help to make sure we’ve done what you needed. Please join us for a focus group and usability test of our website and catalogue on March 12th at 10.00. There’ll be a one-for-all voucher for the first ten participants to register, to thank for your time. Please register here if you are interested in participating. The Academic Writing Centre (AWC) will remain open daily until the end of March. The AWC provides free one-on-one sessions on academic writing. If you are a student at NUI Galway, you are most welcome to attend, whatever your discipline, year or grade average. The AWC is ' a very good service'; the session 'was perfect'; 'the AWC is very valuable; it is a great help for students'. We would like to thank you for your positive and constructive feedback and to encourage more students to visit the AWC. This month, on most days there will be two or more tutors working at the same time, so that you do not have to wait to start your session. Thanks to the near completion of the Arts, Humanities and Social Sciences Research Building, the construction noise has stopped, so that morning sessions at the AWC are even more enjoyable and productive. Bíonn seirbhís Ghaeilge ar fáil maidin Dé Luain agus maidin Dé Céadaoin (11.00-13.00). The AWC is primarily a drop-in service: there is no need to book an appointment, simply come in during our opening hours. If you prefer to make an appointment, you can do so on our booking page. This option does not cover all our opening hours.